BookPeople is proud to be a partner in literacy with BookSpring. BookSpring places books into the hands of children in our community! BookSpring is a 501 (c)(3) nonprofit that provides rich reading experiences, tools, and books to children and their families so they can develop a desire to read and succeed in school and life. Through schools, childcare centers, medical clinics, and community partners, we serve approximately 40,000 children annually through over 150 partners in healthcare, education, and throughout the community. While all children can benefit from becoming a reader, the greatest advantage is to bridge the early literacy gap in low-income families, and those children are our focus. Our goal is to double operations! There are an estimated 79,000 children under the age of five living in poverty in our region. National studies show the rate of books per child in low-income families can be as low as 1 book per 300 children. In contract, middle-income families have an average of 13 books per child. Research also shows that as few as 20 books in the home is a predictor of three more years of education over those without a home library, where they have books around to read again and again. Our continuum of literacy programs provide at least 20 high quality, developmentally and culturally appropriate books to keep from birth through age 12. Our “20 books for every Central Texas child by 2020” initiative will set up our children as well as all of Central Texas for success. Can you think of anything better than helping meet the need of families with young children and cultivating lifelong readers and learners in Central Texas? Check out the BookSpring Wish List below. You can donate any and all of these books to BookSpring for use in their education programs simply by entering DONATE in the comments box during checkout. Or you can pick up the books in store and donate them here! Thanks for helping us support literacy in our community! Every month, BookSpring members choose a featured book they love. This month's pick is She Persisted by Chelsea Clinton, illustrated by Alexandra Boiger, a beautiful picture book that celebrates women in history who have spoken up for what's right! 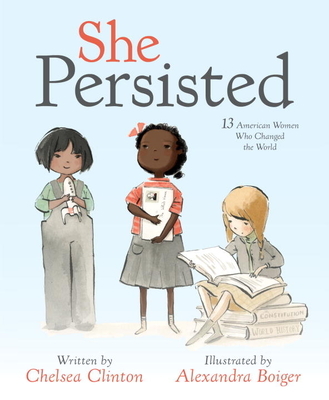 BookSpring needs copies of She Persisted to use as read aloud stories for their activities and to distribute to children at high-need preschools in the Austin area. Interested in volunteering with BookSpring to help spread the joy of reading? BookSpring offers a variety of individual and group volunteer activities throughout the year! Visit BookSpring's Get Involved page to see the options available or to request more information.